I must say that life is kicking great lately (even though I stumble once in a while). Yet, I still feel grateful for the blessings and people around me – both good and bad ones. I usually skip the bad ones, why should I have them on my list, then? Ambil yang jernih, buang yang keruh. Life must go on, anyway. Let those people do the talks. If they believe in karma, then they should be aware that whatever they spit might come back to them, sooner or later. I just wanted to share a ‘place’ where I usually read, and I really found that this is a very interesting place to waste my precious time – Scary Mommy. It has lots of informations, and confessions from the parents, as well as tips for ‘new’ parents. It’s all packed with humour, and sarcasm. I’m in love with the confessional dashboard, anyway. Last but not least, have you been hated on? 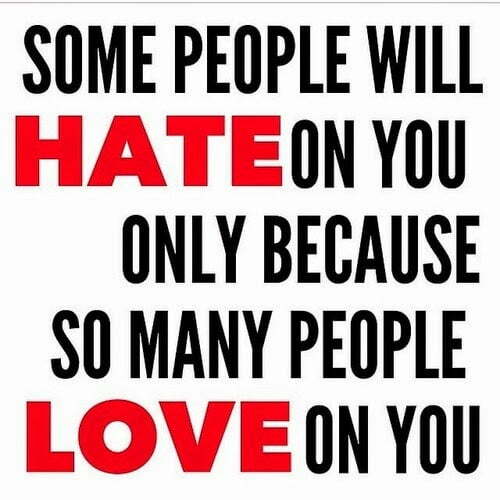 Most of the time those people who are hating are doing so because of their own insecurities. You might have things or the life that they really wished to have. Of course they wouldn’t admit it because they wanted to bury their ego as part of their life. We cannot please everyone, anyway. Skip all the worries of what others might say about you. Let them do the talks, or splurge their confessions over the Facebook or Twitter. Just be yourself, and God will always bless you with lots of good people around you. Till then. Sia mau masuk tidur dengan mask sia.